Lara Croft’s origin story is about to come to an end, and that means she’s more capable than ever. Three adventures in, it’s surprising Lara Croft isn’t yet ‘the Tomb Raider’. Her latest adventure, Shadow of the Tomb Raider, is branded as the finale in her journey to becoming the adventurer she’s known as to video game players. Stretching out Lara’s origin story this far sounds strained, but when the games are taken in context, that gradual evolution works surprisingly well. 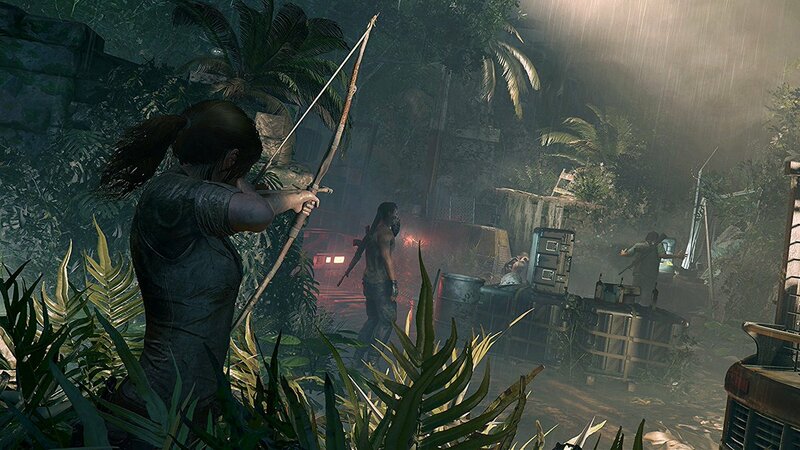 2013’s Tomb Raider was a welcome change of direction for the series, borrowing ideas from the wildly successful Uncharted and feeling thematically rather similar to the raw, rough-and-ready reboot of James Bond we got in Casino Royale. That comparison makes sense, too – Lara’s character origins owe as much to 007 as to Indiana Jones. After playing Shadow of the Tomb Raider and hearing its developers explain their approach, I feel significantly reassured about this next step. While nu-Lara’s second outing was a bit of a stumble (a characteristic shared by Bond’s Quantum of Solace, incidentally), this one appears more assured – and that’s driven by the character herself being a more sure and formidable force. The developers say that the story will challenge Lara, and that she’ll have more contact with other people this time around, with that used to allow her to be questioned in order to force her to grow in new ways. The opening title screen of the demo I play says it all: Lara’s hiding among ruins, with two private military goons lurking above her. She’s clutching a bladed weapon and is visibly ready to brutally murder the pair of them. While Rise of the Tomb Raider felt like a more incremental step, this Lara immediately seems to be one who has grown more comfortable with her role. She doesn’t wring hands about the killing this time. She’s saving the world, and that omelette requires her to brutalise more than a few eggs. In a brief trailer at the end of the demo, I catch a glimpse of her taking on some wildlife too. The more callous Lara might be beginning to rear her head, and I’m okay with that. The demo is fairly linear, though eventually things will open up in the game’s main jungle setting. Talk from the team at new lead developer Eidos Montreal suggests that the new game world exists in part to justify this shift to a more capable Lara. At first she was a survivor, and then a learning hunter. Now she’s mastering the environment around her. The developers describe the jungle setting of Shadow of the Tomb Raider as “the most important character” in its story. 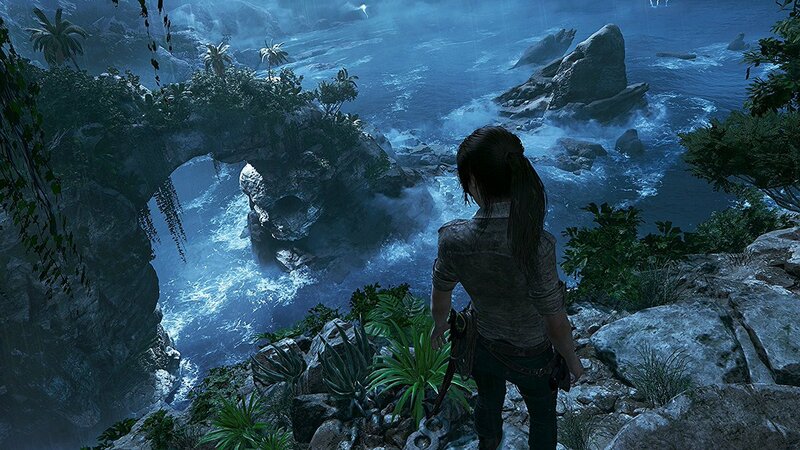 They talk about Lara having a dialogue of sorts with the environment, and how it can be both ally and enemy. In actual video game terms this translates to more interactivity that can be used to assist or work against you. I don’t see that jungle in the demo, however. What I do play feels unabashedly Uncharted – but that’s no bad thing. First, there’s some casual exploration and world building through a marketplace area during Day of the Dead celebrations. Soon enough this transitions to exposition-laden stealth, then a journey through a linear but decently challenging tomb. There’s everything you’d expect in here: climbing, a couple of quick time events, puzzles of both the brain-teaser and spatial awareness variety, and, as is Tomb Raider reboot tradition, some nasty near-death experiences for Lara. A major part of this tomb is an introduction to underwater exploration, and this initially fun little sequence leads to a toe-curlingly raw moment where Lara nearly drowns that’s utterly sold by excellent audio work. It is, bluntly speaking, more of the same, albeit refined. You likely already know how up for that you are. Once the tomb is explored and the requisite artefact recovered, the segment is topped off with a shoot out with some private military goons complete with coincidentally useful chest-high cover and bright red explosive barrels – because of course it is. When strung together as well as they are here, the shifting pace and tone of these different modes of play serve to keep you well engaged. As shooting begins to get a bit boring, it’s time for some traversal; when you tire of that, it’s puzzle time. It’s a formula well tested in Uncharted and the previous Tomb Raider games, and it’s just as potent here. It is, bluntly speaking, more of the same, albeit refined. You likely already know how up for that you are. The only complaint I can level, in fact, is the camera, which feels a little erratic and unpredictable. This sadly has a knock-on effect when shooting more twitch-based weapons, too – the bow felt fine but a rifle didn’t feel great to shoot. Everything else was solid, however. In places it just feels unfinished, like the odd bit of animation jankiness, but the quality elsewhere suggests all that will be ironed out. It looks a treat, too. Running on an Xbox One X development kit, Shadow of the Tomb Raider is an absolute treat to look at, and even at this unfinished stage of development it ran relatively smoothly. There’s some lovely artistic choices, and while in cinematic sequences things like facial animation aren’t quite at the uncannily realistic point some other titles are reaching with pre-rendered sequences (the eyes are absolutely incredible, mind), Shadow of the Tomb Raider shines most when the camera pulls back, revealing gorgeous environments and impressive vistas, or in quieter moments in town featuring a surprising level of colorful, enticing detail in its world. The tone is what interests me most, however. The developers say that the story will challenge Lara, and that she’ll have more contact with other people this time around, with that used to allow her to be questioned in order to force her to grow in new ways. Lara appears more resolved if not as cavalier or camp as her ’90s self, and this is mixed with other beats that are surprisingly uncompromising. The demo closes out with a huge set piece: a tsunami approaches and rips through the city. This leads to a gorgeous sequence as you and the rest of the town try to save yourselves from the rapids. As Lara begins to heft herself out, a child hangs desperately from a nearby window and screams for help. Croft reaches out to him and screams at him to hang on, but he doesn’t. He can’t. He falls into the water and is swept away. Lara is left horrified. It’s a surprising moment, as it’s a flash of pure horror slap bang in the middle of Lara’s triumphant, thrilling escape from danger. I actually appreciate this, to be honest – if they’re going for the grim-dark tone, they may as well fully go for it. So they do. To return to the Bond analogy, it predictability continues to be more like Daniel Craig’s iteration than the nudge, wink, tongue-in-cheek 90s Pierce Brosnan interpretation. On paper, a lot of this feels like it shouldn’t work. The three-part origin story, the experienced and yet still somewhat vulnerable Lara, the strange dissonance between hokey world-ending Mayan threats and the very brutal drama of an entire town being wiped out by a very realistically represented tsunami – it sounds potentially enormously messy when written out like that. And yet, somehow, it clicks brilliantly – or does in this limited forty-minute demo, at least. Even in the wake of the very ambitious Final Fantasy 15, Tomb Raider still feels like Square Enix’s most invigorated blockbuster franchise – and Shadow of the Tomb Raider seems like it has the potential to be the best in the rebooted series. I’m keen to see more and play the final game when it arrives in September.